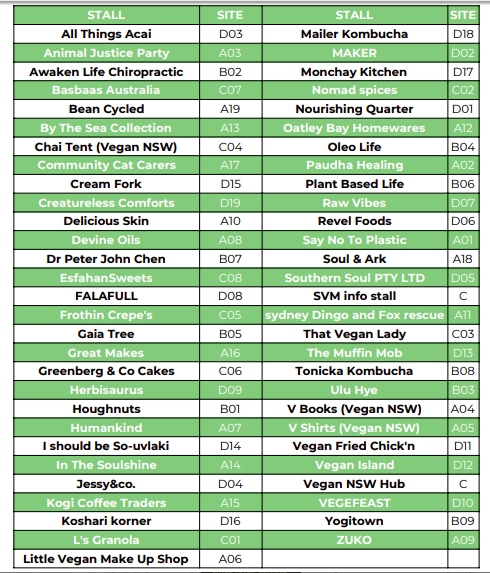 We were so excited to announce that the June edition of Sydney Vegan Market would be held on 24th June and that once again we had teamed up with our mates and venue partners COMMUNE to hold the market in their awesome space. In June it ran from 10am to 4pm, with two sessions: 10am-1pm and 1pm-4pm and it was a huge success! OUR DIRECTORY WAS HOT HOT HOT! TENT Talks is a program that aims to give a platform to voices that are not normally heard in society. We encourage those of you who have never given a TENT Talk before, who come from culturally and linguistically diverse backgrounds and/or the LGBTQIA+ community to work with us to give a talk! At the June SVM we got to hear John of PlantBased Life and Michelle, President of Vegan NSW chat about the things that are passionate about and it was awesome to hear what they had to say. Don't forget to bring your dogs! COMMUNE is a dog friendly venue, and the pup situation in June was a very good one! We gathered a bunch of local vegan DJ's for June and what a vibe it was! We had folks dancing and hanging out in the sun and we cant wait to bring the tunes again for July! WE CAN'T WAIT TO SEE YOU IN JULY!! !